Now even though I sit lusting over expensive high-end brands daily I also have a major (even bigger) love for bargains! Products that are totally cheap and cheerful and work really well for the minimal price that they are! 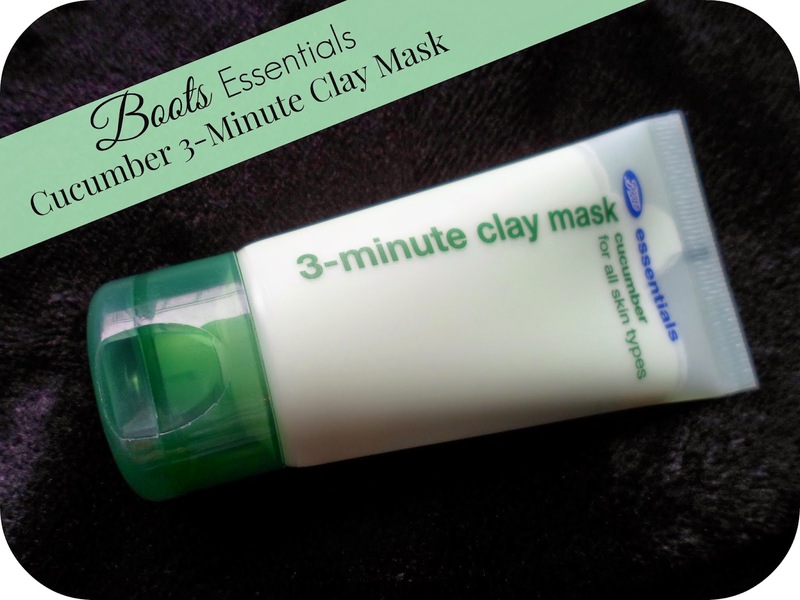 Today I have one of these products - the fab Boots Essentials Cucumber 3-Minute Clay Mask. This is a super popular range from Boots and with teeny tiny prices and great results I can see why! I'm such a fan of face masks, it's like having a mini facial you do yourself at home leaving you feeling funky fresh! I picked this up on a whim, mainly because of the price - it's the same price at the moment as a single sachet face pack so why not get a whole tube?! Also I love the smell of cucumber products and this doesn't disappoint! Just one 20p sized dollop goes along way, spread over your clean cleansed skin and relax for 3 minutes while it does it's magic! For a bit of extra relaxation why not pop some cucumber slices over your eyes and have a nice lie down?! Tackle those puffy, tired eyes aswell as refreshing your skin! I love face masks like this when you can really feel them working and see them getting harder and tighter! For a cheap product this stuff leaves me skin feeling so soft and looking alot more toned and even! It is such a quick product to use aswell - just 3 minutes once or twice a week and wash it off - its so easy! The scent is lovely and relaxing, not overpowering and synthetic like other masks you can get and it feels really soothing, not harsh or abrasive at all. Now this is normally only £1.50 but at the moment it is on promo for only 99p (along with the rest of the range) which is a total steal! Definitely worth picking up if you are a skincare lover and I even think it would be okay on more sensitive skin! I bet most of you could even use your Boots advantage card points to pay for it - a freebie! What do you girls think? Do you use brands like these? Love a bargain like me? I've been searching for a mild face mask, and this sounds RIGHT up my alley! Definitely giving it a go! Thank you for the recommendation :) Happy Friday! This facemask sounds lovely and like an absolute bargain! I will definitely be trying it! My face mask collection has slowly been dwindling so I think I'll be picking this up and giving it a go! I love cucumber face masks, they always leave my skin feeling so refreshed! I love this face mask, it seems to be the only one that actually sorts out my skin rather than breaking me out after I use it. I also love the price of this! Thanks for this lovely, I'm looking for a face mask at the mo and go into Boots quite a lot so I'll be checking to see if they have this next week :), amazing price too!